Alexander Hamilton was one of the most influential of the United States&#039; founding fathers. As the first secretary of the treasury he placed the new nation on a firm financial footing, and although his advocacy of strong national government brought him into bitter conflict with Thomas Jefferson and others, his political philosophy was ultimately to prevail in governmental development. Hamilton&#039;s own career was terminated prematurely when he was killed in a duel with Aaron Burr in 1804. While not as famous as Founding Fathers like Ben Franklin or George Washington, Alexander Hamilton played a key role in the early formation of the American government. A man of great intelligence and ambition, he served on Washington's Revolutionary War staff from 1777-1781. After the war Hamilton co-wrote (with John Jay and James Madison) the famous 'Federalist' essays. (Hamilton signed his essays as 'Publius.') Hamilton believed in a strong central government and a strong national bank, convictions which put him famously at odds with Thomas Jefferson. In 1789 President Washington appointed Hamilton as the country's first Secretary of the Treasury, a post he held until 1795. The youngest of two illegitimate sons born to Rachel Faucett Lavien, a Huguenot, and James Hamilton, an irresponsible but charming Scottish merchant, Alexander had no birth certificate nor baptismal record to track his early journey. What remains in print is a single document stating his age at 13 in 1768 when his mother died. What is known, however, is that Alexander, his brother James, and their mother, who had been abandoned by their undependable father in 1765 on St. Croix, lived on the bottom rung of white society on the mercilessly stratified island. (born Jan. 11, 1755/57, Nevis, British West Indies—died July 12, 1804, New York, N.Y., U.S.) U.S. statesman. He first came to the U.S. in 1772, arriving in New Jersey. In the American Revolution he joined the Continental Army and showed conspicuous bravery at the Battle of Trenton ( Battles of Trenton and Princeton). He served as aide-de-camp to Gen. George Washington (1777–81); fluent in French, he became a liaison with French commanders. After the war he practiced law in New York. At the Continental Congress, he argued for a strong central government. Alexander Hamilton was born on the island of Nevis in the West Indies. His Scottish father and French mother were not married. Early in life he showed great intellectual potential and was sent to New York City for schooling by a sympathetic clergyman. Hamilton completed his basic schooling and was later admitted to King's College, now Columbia University. Patriotic fervor was at its height during the 1770s and young Hamilton impressed many with speeches and pamphlets. The video story of a founding father who laid the groundwork for the nation's modern economy -- including the banking system and Wall Street. He was also a primary author of the Federalist Papers. Duration: 1:52:27. Born in Fauquier County, Virginia, on September 24, 1755, John Marshall became one of the most influential leaders of his time—the era of the American Revolution and the founding of the United States of America. As a young boy, Marshall was influenced and encouraged by his father's friend, George Washington. Marshall served in the Continental Army, first as a lieutenant and then as captain. Enduring the hardships of the winter at Valley Forge (1777-1778), Marshall's admiration of Washington grew as did his resolve to help shape what was to become the new nation. Alexander Hamilton grew up in a family characterized by financial hardship, marital discord and bitter separations, public humiliations, parental death and abandonment. As a child, Alexander experienced ongoing tragedy, adversity and hardship. This early childhood environment serves as the unlikely backdrop for Alexander Hamilton's rise. Alexander Hamilton was born in January 11, 1755 on the West Indies island of Nevis (an island held by the British), the illegitimate child of James Hamilton and Rachel Faucett Lavien. Rachel died in 1768. At twelve, Alexander became a clerk and apprentice at a counting house. At fifteen, he was left in charge of the business. The Royal Danish-American Gazette published Hamilton's description of a hurricane on August 30th, 1772, spurring his family and friends to provide the means for Hamilton to be educated. Alexander went to a grammar school in Elizabethtown, New Jersey and then studied at King's College (now Columbia) in 1774, obtaining a Bachelor of Arts degree in only one year. The Federalist Party was the first grass-roots political party in world history. It was founded by Alexander Hamilton in the early 1790s to rally national support for Hamilton's economic programs and creation of a strong national government. Notable spokesmen included Alexander Hamilton, John Jay, John Adams and author Noah Webster. The party greatly admired George Washington; Washington was never a member but did endorse most of its policies. The Federalists were vigorously--and even viciously--opposed by the Democratic-Republican Party formed by Thomas Jefferson and James Madison. Alexander Hamilton was born in 1755 in the British West Indies and mortally wounded in a duel with Aaron Burr on July 11, 1804, in Weehawken, New Jersey. The trajectory of his life over those 49 years included remarkable accomplishments. He served in the Revolutionary army as lieutenant-colonel and aide to George Washington, fought tirelessly for ratification of the Constitution, and played a pivotal role in defining the governmental mechanisms for managing the national economy. Yet Hamilton's image in the American consciousness, the memory that the public retains of him, remains cloudy and vaguely negative. Hamilton was born in 1757 on the island of Nevis, in the Leeward group, British West Indies. He was the illegitimate son of a common-law marriage between a poor itinerant Scottish merchant of aristocratic descent and an English-French Huguenot mother who was a planter's daughter. In 1766, after the father had moved his family elsewhere in the Leewards to St. Croix in the Danish (now United States) Virgin Islands, he returned to St. Kitts while his wife and two sons remained on St. Croix. Download the Federalist Papers for free. 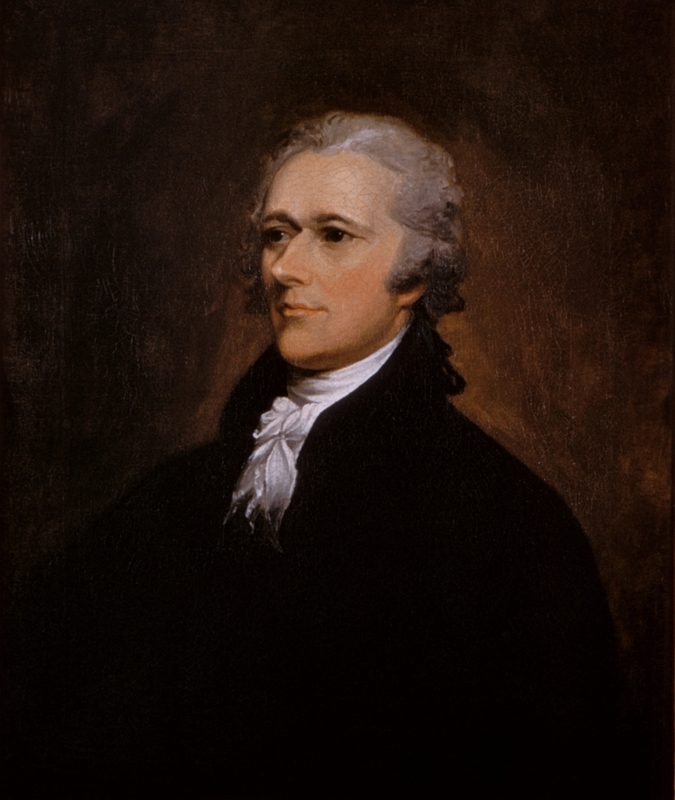 This site holds more than 200 resources about Alexander Hamilton (1755–1804), founding father, first Secretary of the Treasury, part-author of the Federalist Papers and advocate of a strong central government.